Where children, families, and teachers learn, create and grow together! ​Promoting quality early childhood education, empowering families, advancing educator preparedness, and creating a seamless system of support for youth in need, all through evidence-based school readiness practices. The Hub @ USMH is grant funded by Maryland State Department of Education. We are a partnership between Frostburg State University and The University System of Maryland Hagerstown. We offer programs for parents and children in Washington County to help all children be kindergarten ready. ​Gatherings for parents and children on Tuesdays at Noland Village Community Center from 4:30-5:30pm. Our focus is on children 2-4, but children 0-12 are welcome. Each week is a new topic. Please join us on Thursday from 6-7. Snacks or dessert will be provided, but no dinner. Each week will have a take-home activity or book. 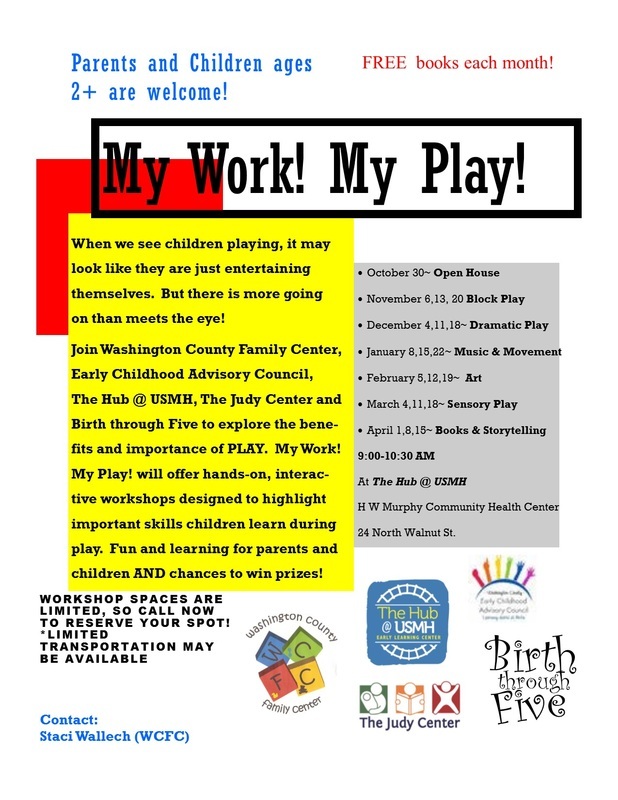 Playgroup for parents and children Thursdays, February 4, 11, and 18 from 3:15-4:15. April 5, 12, and 19 join us for Coffee Break at AM and PM drop off for families at Noland Village. Make and Take activities and snacks and, of course, coffee. Character Counts! Workshop on Thursday, October 22, November 19, and December 10. The Washington County Mediation Center Workshop to learn more about anger management and conflict resolution on Thursday, November 5 and 12. All children and parents are welcome. FREE books or activities for kids!